Doubt is the doorway to transformation. It is the invitation to awe and wonder, to mystery. Where our preconceived ideas keep us blind to possibilities doubt opens the way. We question what we know and create space for something new to show up. There is an old story of a student of Zen Buddhism who traveled deep into the hills of Japan to meet with a renowned teacher. He was so excited that as they sat down he began to talk and talk and talk about all he knew about Buddhism. As he talked the Zen master quietly went about preparing tea for the two of them. He filled his guest’s cup. His visitor gestured that it was enough but even as he did he never stopped talking. He was just soo excited! The Zen master quietly kept pouring and pouring and the cup overflowed onto the table and over the edge onto the floor and the student yelped and jumped up. “Why are you pouring tea all over?” he asked, incredulous. “You are like this cup,” the Zen master answered, “you are so full of your own ideas and preconceptions that there is no room for anything new.” I’m like that often. I think I know what is coming and I don’t always leave room for the unexpected, the novel, the new. Doubt helps me find space to see from a different place, and when I see things differently, I’m changed, and then everything else changes. I live from a different place. The interesting thing about gaining a new perspective is that it seems hardest to do when we most need it. When we are hit with loss and grief, when our plans are disrupted and chaos infiltrates our future, just when we most need to see from a new place, this is when it can seem impossible to do so. It is in this place of grief and loss that we join the disciples in our story. The radical ministry of Jesus had shaken everything that his disciples believed in. We are rational beings after all, we know that the lame cannot walk, the blind cannot see, the dead do not rise. These certainties are, well, as certain as death and taxes. Yet Jesus had defied them! Had turned them on their head. Time and again he had upset the order of life, the order of society, he had disturbed the peace of our orderly expectations. He had elevated the outcast and included the untouchable, the despised. He brought life and healing where there was death and disease. Yet where our storyline picks up today, Jesus had failed, the disciples had failed. The powers of the world, of the government, of the military might, of the religious leaders had prevailed and Jesus, the surprising and unexpected savior, had died on a cross like any ordinary man. There was no surprise and everything happened exactly as expected. Challenge the powers that be, those with wealth and might and they will crush you. This is the way of the world, isn’t it? Our story today starts with failure, with the disciples hiding in fear, feeling deeply their failure to be faithful to their lord, their friend, feeling his failure to overcome the powers that be. How could it have gone so wrong? The joy that they felt watching Jesus bring new life to those whose lives had been diminished; the joy they felt crying out his name when he rode into Jerusalem, it seemed so very far away. Now they hid, knowing themselves to be small and weak, knowing they could not challenge the might of those in power. The joy that felt so powerful, so undeniable just a few days ago, was gone. The subversive, gentle, surprising power that Jesus had seemed to have only days before had failed. He had slipped out of such difficult places before, putting a little gentle judo twist on each attempt to contain him, to stop him. He did not come in power with an army, with weapons. Somehow, the disciples must have reasoned, he would put a little twist on his conversation with Pilate and walk free or better! But it hadn’t happened. He had failed and his weakness, his humanity was so palpable. Those who had loved him gathered together in grief and loss and fear. Usually this story, the story of Doubting Thomas, is told as an admonishment to have more faith! But no one in John’s gospel believed on faith alone! No one! No one said, “well, I know he was supposed to have died on the cross but that’s all wrong, you see, he’s OK. I’m just headed off to Galilee to see him. Do you want to come?” No one believed until they saw him, until he said, Hey I’m not the gardener Mary, Go on touch me, see me, how about a fish fry on the beach? No one believed without seeing. Their certainty was too strong. We are rational beings after all. There are somethings we just have to accept. The blind do not see, the lame do not walk, the dead do not rise. Might makes right and the one with the money makes the rules. They were certain of this. And this certainty left them hiding behind closed doors. If they had doubted this while Jesus was alive and among them, healing and preaching now they were certain. They were so certain that they had closed their hearts and minds, closed their souls to the unexpected, the fantastic, the never-before-seen. They had shut the door on hope. It is into this fear, this hopelessness and despair, this grief and loss that Jesus becomes present. God does not meet these people in the midst of their strength, their ardent confession of faith but in their fear, in their unbelief that anything new could happen. It is into their certainty that might makes right and that death wins that God becomes present to them not as some overpowering, omniscient force but as their wounded, and touchable friend. God comes to them bearing wounds. God comes to them as one who has become vulnerable to them, as one who has yielded. God meets us at our most obtuse and close minded and blows the doors right off our preconceived notions. God meets us in the midst of our fear and limitations and invites us to live from a different place. 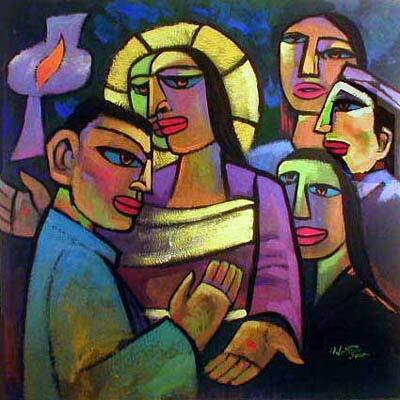 Jesus meets the disciples at their lowest moment and gives them new life. He breathes into them just as God breathed the first breath into the first person. We are given a new life, a new way of being, a new understanding, an abundant life! Jesus said, “I came that you might have life and have it abundantly.” (John 10:10) What does he mean by this? Often we think of scarcity and poverty as being the opposite of abundance but I want to suggest that it is fear that is the opposite of abundance. It is fear that leads us to live small cramped lives, that locks us up in small rooms, in small roles, in small lives. When I live from a place of fear my heart is squeezed, my life gets small and cramped. When I live from a place of fear loving others, trusting, and giving of myself is hardly possible. It isn’t safe. When I live from a place of fear I find myself grasping onto what I have for fear that it won’t be enough, that my needs won’t be met. It makes my life really small. It is in this place of need, of cramped hope that Jesus shows up. Relieved of our fear we open ourselves up to the loving abundance of life lived fully, lived graciously and lovingly. We open ourselves up to be showered with the grace of God. Relieved of fear new possibilities open up and we live boldly! Fear is that which propels us on our anxious course away from each other, away from knowledge and insight, and away from God. Fear is that which speaks into our doubts asking us not to look too closely or at all! Turning away from our doubts and our questions we miss the opportunity for wonder, for awe, for mystery. Fear is that which wishes to contain our understanding of God and God’s love for us within certainty and dogma, that wishes us to limit God to our understanding. Doubt reminds us that we see dimly and there is much more to be revealed than we can see now. So how do we respond? Do we need to be men and women of great courage? Lucky for us the answer is no. We are not asked to have courage. We are asked to see God meeting us in the midst of our fear. We are asked to open our hearts and be vulnerable to God and to each other. We are asked to breathe in the breath of God and be transformed, to live from a different place. One where our fears fade like bad memories. We are asked to move beyond courage, beyond facing our fears to a life lived from a place of joy and gratitude, a place where courage and facing our fears simply isn’t necessary trusting that Christ is there in the midst of our fear, our loss, our failure. Christ has come to meet us with all our fears of death, loss, failure, inadequacy writ large on his body. Meeting our Lord and Savior in the midst of our fears we discover that love surpasses all of these, that joy is still possible. We are invited with Thomas to place our hands in the wounds and fears that seem to be great obstacles, that would stop us from loving and living boldly and abundantly. We are invited to watch our fears disolve in a cascade of confession that Jesus is Lord and love wins! Jesus comes to us in profound vulnerability, entering deeply into failure, death, and loss and when he comes to us he doesn’t leave all this behind but comes bearing the marks, the wounds; he comes not in power and triumph but softly, gently with no fanfare, only love. This is the subversive power and strength of Jesus Christ not a confronting, domineering demanding power but the power of vulnerability, of love exposed and touchable. One that invites us to come close, to feel our own wounds and vulnerability, one which embraces us wholly and completely. It is in these tender vulnerable moments when all we hold certain is questioned, when all we hold dear is challenged, that we are met with God’s grace, with God’s love. Doubt and uncertainty become the doorway where God meets us, where we empty our cup so that God can fill us up again! Albert Einstein said that Imagination is more important than knowledge. For while knowledge defines and contains all we currently know and understand, imagination points to all we might yet discover and create. Previous postwith the joy of a child or not at all!